To Cite: Baratian M, Farajollahi M, Sarmadi M R, Mosakazemi S M. Psychometric Properties of the Pedagogical Evaluation Scale of Synchronous Technologies in Distance Education, Interdiscip J Virtual Learn Med Sci. 2016 ; 7(1):e12075. doi: 10.5812/ijvlms.12075. Introduction: It is important to prepare a scale for the pedagogical evaluation of distance education, in order to obtain more accurate information in this field. Based on the importance of this issue, the present study aims to prepare pedagogical evaluation scale of synchronous technologies in distance education and determine its psychometric properties. Methods: The research utilized a descriptive-survey method. The statistical population consisted of all virtual students (3915 virtual students) from all universities in Tehran who were undergoing distance education in the 2015 - 2016 academic year. A number of 390 graduate students were chosen by random cluster sampling method. For data collection, a self-made scale was utilized. Data were analyzed through SPSS software, version 21. Construct validity, convergent validity, test retest reliability, and internal reliability of this scale were calculated by the exploratory factor analysis model, Pearson moment correlation coefficient, and Cronbach’s alpha coefficient. Reliability coefficient of the scale was calculated with Cronbach’s alpha method for the total scales and its subscales which was variable from 0.73 to 0.90. Results: After determining the face and content validities, the number of items in Pedagogical evaluation scale were reduced from 55 to 39 items. Construct validity of the scale was calculated by utilizing exploratory factor analysis model by principal component analysis method and varimax rotation, finally, 30 items and seven factors were extracted from it. The maximum overall variance (48.21%) was explained by the first 7 factors and the rest (51.79%) was explained by the other 23 factors. The result of exploratory factor analysis in this scale identified seven factors, including telepresence, interaction, flexibility, motivation, assessment, feedback, and perceived learning. Conclusions: The results of psychometric properties of the pedagogical evaluation scale of synchronous technologies in distance education suggested that the aforementioned scale is a reliable and valid instrument for pedagogical evaluation of synchronous technologies in distance education. Therefore, this scale can has important usage in the instructional design for distance learners’ learning. Behaviorism: Learners learn activities and behaviors through observation and personal interaction. Cognitivist: Learners learn by engaging their ideas and experience along with others via collaboration and communication. Constructivism: Online learning should create challenging activities that allow learners to connect the old and new data together and build personal knowledge. This level of higher thinking should be supported by utilizing learning theories as the educational foundation. Connectivism: Based on this theory, required and functional knowledge could not be obtained from personal experience or by utilizing others’ experiences; rather it should be inevitably obtained from creating connections. Learners should try to discover apparently hidden patterns by creating connections and by using the global communication networks or communication between existences and foster the needed skills (5). Due to the effect of learning theories on education, making emphasis on them is very necessary, and again confirms that it is educational strategy (pedagogy) rather than technology that impact greatly on the quality of learning (6). Apparently, the more human’s science develops, the more we need to change learning, and its mechanisms. Distance learning is an educational method which gives the learner and the educator the opportunity for filling the educational gap with the appropriate technology, despite separation from each other in time and place (7). Recent advances in computer hardware, computer software, and communicational technologies have created exciting and new opportunities for utilizing these educational technologies. Distance education programs become prevalent and information technology gives the opportunity for educational institutions to utilize distance education as an instrument of offering and organizing curriculum (8). Regardless of which learning theories, effective distance education affects some variables and conditions, such as interactivity, flexibility, telepresence, motivation, feedback, measurement, skills and techniques of study, conditions and facilities of educational environment, features and personality characteristics. Researches in the field of distance education have revealed that this environment has every benefit (9-12), especially convenience, flexibility, and availability at any time and place (13-18). Distance learning reduces costs and increases telepresence, flexibility, interaction, motivation, access and the number of learners (19, 20), it has the ability of creating a rich and motivational educational environment (21), and gives learners the ease and flexibility through learning at any time and place (22), it also increases the amount of communication and contribution of the users (23), and the learners has more opportunities to express their thoughts and impressions (24). This is demonstrability process, because by interacting with others, one can improve increasingly. Communication strengthens instructional scaffolding and the zone of proximal development (ZPD) (25). Another desirable feature of distance learning is changes in learning environment and shifting the role of the learners and teacher. Educator’s role is to act as a facilitator while learners’ role is to actively participate in the learning process (10, 13). Distance education provides countless opportunities via communication and information technologies which had previously not been possible (26). According to Bruner (27), these technologies are powerful instrument for education. They are cognitive instrument which help the learners to develop their idea and engage in meaningful learning (28), they provide access to various learning and teaching materials (29), and make the environment equal for rural and destitute learners (30). In addition, they improve distance education (31). It can be said that distance education is the most important factor in developing informational technology, and pragmatism’s proponents should carry out important tasks on this field at the University (7). In recent decades, distance education has gained remarkable recognition because of some reasons such as advances in information and communication technology, dramatic increase of applicants of higher education, lack of funds, low capacity of higher education for attracting all applicants, social and economic changes, affordability and comfort, and the necessity of lifelong learning. Coaches increasingly use synchronous and asynchronous communication methods based on information and communication technology, in order to enhance distance learning. Using communication methods based on information and communication technology, learners can now participate in the classroom in real time, interact with the instructor and peers, and access to resources according to the proper time, place and pace of learning. So information and communications technology has the capability of providing instruction in any time, place, and for everyone connected to the Internet. Recent advances in information and communication technology have lead to the vast improvement in the researches and distance learning methods. However, it seems that the widespread utilization of communication methods based on information and communication technology in distance education is faster than researches in this field. Rapid development of ICT-based communication methods in distance learning has contributed to concerns about research requiring which provide a scale for pedagogical evaluation of programs that utilize these technologies, and guiding future development. Distance education should not only be considered as an offering system, but as a kind of pedagogy (32). This is pedagogy (teaching method) and not technology that connect teachers, learners, and content of instruction in a meaningful way. Now that distance education is widespread and different technologies have been developed, doing some researches for pedagogical evaluation of these technologies of distance education in higher education seems necessary. Therefore, it is necessary to make a scale for pedagogical evaluation of information and communication technology of distance education in order to access more detailed information. This scale should be based on theoretical foundations of distance education models, learning model, and characteristics of distance learning based on information and communication technology, and its psychometric properties. In addition, because of few researches in the pedagogical evaluation of distance education technology and the lack of valid scale, the importance and necessity of the present study is emphasized. Using this scale, a framework for professionals and researchers of distance learning and virtual training can be provided in order to design effective distance education by information and communication technologies and evaluate the technologies of offering courses in terms of pedagogical features. With this aim, this essay seeks to answer this fundamental and special question whether the scale of pedagogical evaluation of synchronous technologies in the distance education has acceptable validity (construct) and reliability. 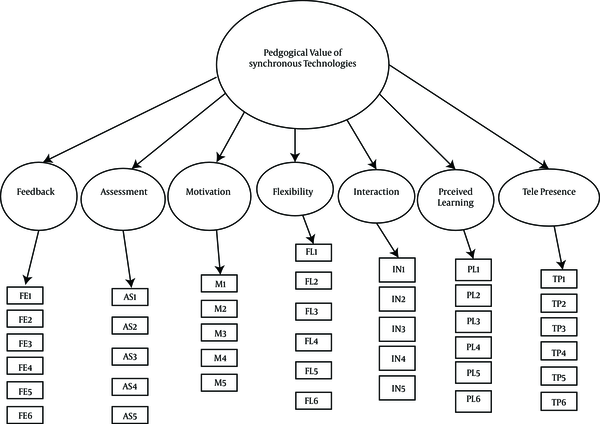 Based on the literature review and theoretical foundations of research, pedagogical features of contemporary technologies in distance education were identified and a model was designed for determining its validity and reliability (Figure 1). 1 Does pedagogical evaluation scale of synchronous technologies in distance education has acceptable reliability? 2) Does pedagogical evaluation scale of synchronous technologies in distance education has acceptable (construct) validity? The method of the present research is descriptive - survey and this kind of research based on its goal is a developmental research. The statistical population consisted of all virtual students (3915 virtual students) from all universities in Tehran who were undergoing distance education in the 2015 - 2016 academic year. Using cluster random sampling method, a sample of 390 subjects were selected according to Morgan’s table (200 females and 190 males) among all the graduate distant learners in the 2015 - 2016 academic year. Tabachnick and Fidel (33) argue that for the study of the factor structure, 300 is desirable. Criterion for sampling from the statistical population was students’ experiences of distance courses through video conference. In other words, virtual students completed the scale if they experienced distance courses implemented by the video conference technology. So among the universities which implement distance education, Payame Noor University, Tehran University, Tarbiat Modarres University, Khaje Nasir University were chosen and the questionnaires were completed by the learners. A scale (Figure 1) was made based on distance education models, learning models, and features of technology-based distance education for measuring 7 factors, 55 items were selected and adapted from other researchers’ scales. The subscale questions on telepresence were selected from the researches of Rourke et al. (9), Anderson et al. (34); Lessiter et al. (35); Rovai (36); Biocca et al. (37); Devi (38); Arbaugh (39); Swan et al. (40); Bangert (41); and Shea and Bidjerano (42). The subscale questions on interaction were selected from the researches of Dillon and Walsh (43); Shepherd et al. (44); Arbaugh (45); Beebe (46); Yoo and Alavi (47); and Devi (38). The subscale questions on flexibility were selected from the researches of Dillon and Walsh (43); Shepherd et al. (44); Arbaugh (45), Devi (38). The subscale questions on motivation were selected from Cassidy and Eachus (48); Barbeite and Weiss (49); Shroff et al. (50). The subscale questions on assessment were selected from the researches of Jonassen et al. (51), Jones and Knezek (52); Carr-Chellman and Duschatel (53), Riccomini (54), and Zarif Sanayei (55). The subscale questions on Feedback selected from the researches of Alavi (56); Riccomini (54); and Zarif Sanayei (55). The subscale questions on perceived learning were selected from the researches of Alavi (56); and Hiltz (57). (A) There was no significant correlation to any questions. (B) They were correlated to more than one question, therefore based on the many number of questions and because there was need to minimize the correlation between questions, they were excluded for the final analysis. Finally, data were analyzed using SPSS software, version 21. Construct validity, convergent validity, test retest reliability, and internal reliability of this scale were calculated by the exploratory factor analysis model, Pearson moment correlation coefficient, and Cronbach’s alpha coefficient. Reliability coefficient of the scale was calculated with Cronbach’s alpha method for the total scales and its subscales which was variable from 0.73 to 0.90. Scoring is based on the Likert scale, and the answers were graded as follows: (a) Completely agree, (b) agree, (c) somewhat agree, (d) somewhat disagree, (e) disagree, (f) completely disagree. The cases (a) to (f), were scored 1 to 6 respectively (Table 1). Telepresence 2. Feel part of a large class or learning community. 4. Feel learning along with other students. 10. Feel the need to keep up with the course readings. 30. Feel more noticed by the lecturer. 31. Feel more noticed by the students. 35. Feel learning in virtual classroom is similar to learning in face-to-face classroom. Interaction 6. More interaction with teacher and other students. 11. Easy understanding of lecture notes and lessons. 26. Better performance on course tasks. 32. Sending new messages to teacher and other students. 36. Respond to views posted by the lecturer and other students. Flexibility 5. Continue my education during job and earnings. 9. Arrange my course time. 13. Study presented course according to my learning pace. 15. Access to virtual classroom and use of it in desired place. 38. Access to virtual classroom and use of it in desired time. 37. Use of teleconference in other courses. Assessment 1. At the beginning of the course, teacher organizes new learning experiences based on our learning needs, prior knowledge, and skills. 3. Teacher evaluates my academic achievement during term. 16. Teacher considers class work and attempt on final score. 19. Teacher evaluates my academic achievement in the final term. 33. Tests embedded in teleconference that automatically assess and scored my course information. Feedback 14. Teacher gives instant feedback and on time feedback. 17. Other students gives instant feedback and on time feedback. 21. Enable me that ask of Other students and modify my perception or imoression. 23. Enable me that ask questions of teacher and resolve my ambiguities. 25. Enable me systemically resolve my course problems. 34. According to course tasks and exams results during term, resolve my course weak points. Perceived learning 12. Well learned basic course concepts. 18. Communicate with course subjects. 20. Learn to link together important problems in course materials. 24. Learn more real information in this course. 28. Learn to identify important course problems. 39. Information and course tasks improved my ability for synthesize facts and generalize facts. Scores 3, 4, 5, 5, 4, 5, 4 were for each of the telepresence, interaction, flexibility, motivation, assessment, feedback, and perceived learning subscales respectively and total score 30 indicated that video conference is a good pedagogical tool for implementing distance courses. Therefore, cutoff point for the current scale is 30. It is necessary to note that in all of the research stages, complete report was presented to the participants on the case study and its goals. Three calculation methods of internal consistency of questions (Cronbach’s alpha method), test retest method, and split method were utilized to check the reliability of the scale. 1. Internal consistency (Cronbach’s alpha method): The final result of the calculations estimating the reliability of subscales and total scale in initial study revealed that the coefficient alpha for the subscales were 0.76 to 0.89 and total scale was 0.90 (Table 2). 2. 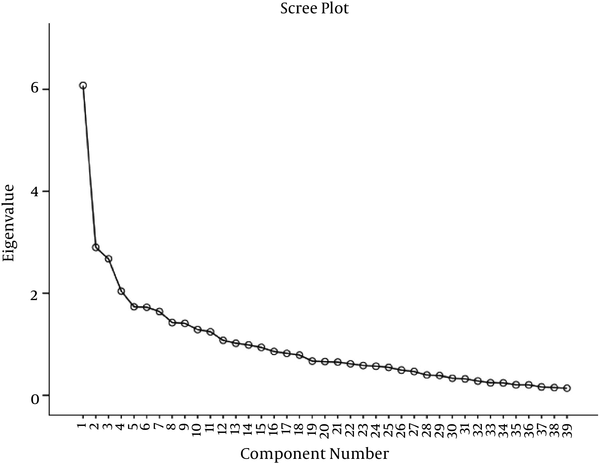 Test- retest: coefficients of correlation between two sets of subjects’ scores were calculated during the four weeks interval in subscales and total scale. Correlation coefficients range was 0.40 to 0.88. Consequent calculations revealed a significant difference in the error level of 0.01. The latter result implies a relatively large homogeneity and heterogeneity between the scale items (Table 3). 3. Split-half method: In this study, statistical analysis revealed that the Pearson correlation coefficient between the two odd and even halves of the scale is r = 0.75. This reliability coefficient signifies that the two halves of the scale are highly correlated and this would be an indicative of good internal consistency of the test (Table 4). Three methods, including content validity, convergent validity, and construct validity were utilized for measuring the validity of the scale. 1. Content validity: as earlier stated, content validity of the pedagogical evaluation scale of synchronous technologies in distance education was confirmed by some of the experts. 2. Convergent validity: to study the convergent validity of the scale, the correlation coefficients were utilized between subscales of pedagogical evaluation scale of synchronous technologies in distance education. Results of Table 1 reveal that the subscales are significantly related with each other and with the total scale, so this relation indicates the convergent validity of the scale. The first factor contributing to the variance of the seventh item scale is impressive and the share of the differentiating factor (Table 5). 3. Construct validity: using factor analysis method, the validity of construct of pedagogical evaluation scale of synchronous technologies in distance learning was examined. The principal component analysis with varimax rotation methods was utilized to explore the factor structure of the scale. The amount of criterion of adequacy of sampling (KMO) was equal to 0.720 and the statistic of Bartlett test was equal to 5439.856 which indicate the number of samples and factor analysis used to identify the structure-factor model and the hypothesis on known correlation matrix was rejected (Table 6). To determine the set of constitutive material of pedagogical evaluation scale of synchronous technologies in distance education, three criteria from several saturated significant factor were considered which included: Eigen values, the proportion of variance explained by each factor, Eigen values charts or Scree plot of 13 factors is greater than 1 and the percentage of common variance between scale materials for this factors is from 15.582 to the minimal value of 2.616. The combination of these 13 factors explains 67.358% of the total of the variance of the provisions of the scale. Moreover, in scree plot of pedagogical evaluation scale of synchronous technologies in distance education shown in Figure 2 it can also be deduced that the contribution of the first factor to seventh factor in the total variance of scale items is impressive and different from the contribution of the other factors. Among the factors that were obtained by utilizing principal component analysis, 7 factors which were the highest were selected and rotated. In other words, according to Scree plot (Figure 2) and Tables 7 and 8 seven significant factors have been extracted from pedagogical evaluation scale of synchronous technologies in distance education. The first factor with 6 questions and Eigen value equal to 6.077 is about 15.582%. The second factor of 4 questions with Eigen value equal to 2.90 is about 7.437%. The third factor of 3 questions with Eigen value equal to 2.676 is about 6.861%. The fourth factor with 4 questions and Eigen value equal to 2.042 is about 5.235%. The fifth factor with 5 questions and Eigen value equal to 1.736 is about 4.452%. The sixth factor with 4 items and special Eigen value equal to 1.727 is about 4.428%. The seventh factor with 4 items and special Eigen value equal to 1.642 is about 4.211 %. Due to the value of the coefficients of the construct structure, the following can be concluded: The first factor is appropriate for assessing the feature measured by questions 5, 7, 9, 13, 15, 38. The second factor is appropriate for assessing the feature measured by questions 12, 20, 28, 39. Questions 18 and 24 were eliminated in the final analysis. The third factor correlates highly with questions 2, 4, 10. Questions 30, 31, 35 were eliminated in the final analysis. Questions 6, 26, 32, 36 are highly correlated with the fourth factor. Question 11 was eliminated in the final analysis. The fifth factor is appropriate for assessing the feature measured by questions 14, 21, 23, 25, 34. Question 17 was eliminated in the final analysis. The sixth factor is appropriate for assessing the features measured by questions 1, 3, 19, 33. Question 16 was eliminated in the final analysis. The seventh factor is appropriate for assessing the features measured by questions 8, 22, 29, 37. Question 27 was eliminated in the final analysis. (A) There is no significant correlation to any factor. (B) They were correlated to more than one question, therefore based on the many number of questions and because there was need to minimize the correlation between factors, they were excluded in the final. After extracting the questions with high loadings on the first factor and review of shared variance between them, the first factor can be identified as flexibility. After extracting the questions that have high loadings on the second factor and based on shared variance between them, the second factor can be identified as perceived learning. According to the questions that have high factor on the third factor and after examining the shared variance between them, the third factor was named as telepresence. Due to the questions that have high factor on the fifth factor and after examining the shared variance between them, the fifth factor was identified as feedback. Due to the questions that have high factor on the sixth factor and after examining the shared variance between them, the sixth factor was identified as assessment. Due to the questions that have high factor on the seventh factor and after examining the shared variance between them, the seventh factor was identified as assessment. (B) They were correlated to more than one question, therefore based on the many number of questions and because there was need to minimize the correlation between factors, they were excluded in the final analysis. Therefore, the final version of the pedagogical evaluation scale in distance education was constructed with 30 questions, consequently, the results reveals the acceptable validity of the pedagogical evaluation scale of synchronous technologies in the distance education. The results of the calculations about estimating the subscales reliability which constitute pedagogical evaluation scale of synchronous technologies in distance education indicates that the range of reliability coefficients of subscales of flexibility, learning, telepresence, interaction, assessment, feedback, and motivation equals 0.70% - 0.78% and total scale equals 0.83%. In the final study of the calculations about estimating the reliability of subscales which constitute pedagogical evaluation scale of synchronous technologies in distance education indicates that calculated coefficient alpha for seven factors include: the first factor (flexibility) 0.85, the second factor (feedback) 0.82, the third factor (perceived learning ) 0.74, the fourth factor (telepresence) 0.73, the fifth factor (assessment) 0.81, the sixth factor (motivation) 0.77, the seventh factor (interaction) 0.75. Considering the range of reliability coefficient as 0.73 to 0.90, it indicates that the result of the review of the reliability of the scale is desirable. According to these results, this scale has acceptable reliability for pedagogical evaluation scale of synchronous technologies in distance education. Considering that both preliminary and final stages, internal consistency coefficients of constitutive components and the whole set of 39 items of pedagogical evaluation scale of synchronous technologies in distance education has very high and acceptable level, indicates its high accuracy in evaluating pedagogical scale of synchronous technologies in the distance education and measuring the desired characteristics. The results of this study are consistent with the results of Martz et al. (58), Devi (38), Hazari et al. (59), Rourke et al. (9), Anderson et al. (34); Lessiter et al. (35); Rovai (36); Biocca et al. (37); Arbaugh (39); Swan et al. (40); Bangert (41); and Shea and Bidjerano (42). In the final study, the correlation coefficients between the two sets of subjects’ scores were calculated on the successive intervals in the subscales and the total scale. Correlation coefficients range equaled 0.011 to 0.898. Consequently, calculations reveal a significant difference in the level of error as 0.01. The latter result implies that the items of pedagogical evaluation scale of synchronous technologies in the distance education have relatively high homogeneity together. The results of this study are consistent with results of Martz et al. (58), Devi (38), Hazari et al. (59), Dillon and Walsh (43); Shepherd et al. (44); Arbaugh (45); Beebe et al. (46); and Yoo and Alavi (47). In this study, statistical analysis revealed that the Pearson’s correlation coefficient between two halves of the questionnaire is r = 0.75. The reliability coefficient signifies a high correlation between the two halves of the inventory and high internal consistency. This result is consistent with the results of Martz et al. (58), Devi (38), Hazari et al. (59), Cassidy and Eachus (48); Barbeite and Weiss (49); and Shroff et al. (50). This survey revealed that the pedagogical evaluation scale of synchronous technologies have four construct. 1) 6 questions correlate to the first factor called flexibility. 2) 4 questions correlate to the second factor called perceived learning. 3) The third factor showed high correlation to 3 questions regarding the content of the questions called telepresence. 4) The fourth factor showed a high correlation to 4 questions regarding the content of the questions called interaction. 5) The fifth factor is highly correlated to 5 questions called feedback. 6) Factor loading of 4 questions with sixth factor is greater than 0.3 called assessment. 7) Factor loading of 4 questions with seventh factor is greater than 0.3 corresponding to the content of the questions called motivation. Thirty (30) questions of the experimental form of the scale correlates highly to 7 extracted factors and 9 questions were excluded. Weak questions 11 (Easy understanding of lecture notes and lessons), 16 (Teacher consider class work and attempt on final score), 17 (other students gives instant feedback and on time feedback), 18 (communicate with course subjects), 24 (learn more real information in this course), 27 (Lead to saving of time and expenses), 30 (feel more noticed by the lecturer), 31 (feel more noticed by the students), 35 (feeling that learning in virtual classroom is similar to learning in face-to-face classroom) indicate that these questions have weak role in assessing pedagogical evaluation of synchronous technologies, thus there were eliminated from the scale in the final analysis. Therefore, the final version of pedagogical evaluation scale was constructed with 30 questions; consequently, the results reveal the acceptable validity of the pedagogical evaluation scale of synchronous technologies in the distance education. Extracting seven factors based on distance education models, learning models, the characteristics of effective distance education are consistent with the results of the researches of Martz et al. (58), Devi (38), and Hazari et al. (59), Jonassen et al. (51), Jones and Knezek (52); Carr-Chellman and Duschatel (53), Riccomini (54), and Farajollahi et al. (55). Parmeswaran and Whinston (60) noted that research in social computing should be a priority for researchers because of the changes in communication, computing, collaboration, and commerce that are impacted by this trend. During the past decade, the use of Internet has become common in education. Technology has been used as an enabler to facilitate learning. Distance learning has given learners an opportunity to interact with other students in web-based environment by using course management tools that integrate or supplement Web components. However, it is important to note that no single technology by itself (including synchronous technologies) can impact learning outcomes. Mishra and Koehler (61) found that variables such as course content, instructional pedagogy, and technology influence classroom learning; and sound instructional practices are also important components in the learning process. Instructors can explore the potential offered by technology and realize its benefits if used correctly. As shown in this study, as well as the experience reported by instructors in other studies such as Elgort et al. (62), synchronous technologies can promote collaboration in virtual classrooms, encourage negotiation, and make students comfortable with new generation of technology tools. To incorporate synchronous technologies, educators should utilize participatory approaches in which learners become active contributors and producers of content. Students can build collectively on each other’s knowledge by forming “participatory communities.” The goal is to promote student engagement by the use of technology tools and systems. Although this research focused on the use of synchronous technologies (especially audio and video conference) in the virtual universities distance learners, additional research is needed to explore other technologies (such as blogs, podcasts, and social networking) as they relate to student learning, attitudes, motivation, and learner outcomes. Research can also look at different curricula, disciplines, and learning styles of students which may be better suited to synchronous and asynchronous technologies. Today, although virtual environments from various vendors use different features, additional research could look at specific features of synchronous and asynchronous technologies that contribute most to student learning. Also, further scale development is needed because a standardized scale measuring pedagogical implications of synchronous and asynchronous technologies (or other technologies) does not exist. Emerging technologies have the potential to have a significant impact on learner outcomes, provided they are structured properly in the curriculum to increase knowledge, motivation, and enthusiasm for learning. This study included assessment of synchronous technologies within the virtual universities only in the city of Tehran. There was no control group as this was not designed as a causal-comparative study. The intention of this study was to measure the value synchronous technologies may bring into the classroom. Although the factors that contribute to proposed pedagogical value of synchronous technologies were extracted from review of literature for the purpose of providing content validity, due to limitations earlier mentioned, confirmatory factor analysis was not utilized to confirm (or refute) a seven-factor solution that was á priori assumption of the researcher. It was also found that the inter-correlations between the proposed factors were high (Table 5). This might be due to the fact that the sample size may not have been large enough in this study. Despite the limitations of this study, which is typical in exploratory studies, the findings can offer insights to other educators interested in exploring synchronous technologies for teaching and learning in a collaborative setting and serve as a basis for further research. The authors extend their appreciation to all faculty and students of Tehran city Universities who participated in the study. Authors’ Contribution: Study concept and design: Baratian, and Farajollahi. Analysis and interpretation of data: Baratian, and Farajollahi. Drafting of the manuscript: Baratian, and Farajollahi. Critical revision of the manuscript for important intellectual content: Baratian, Farajollahi, Saramadi, and Mosakazemi. Statistical analysis: Baratian. Conflict of Interest: The authors state that there is no financial interest related to the material in the manuscript. This is an essay published from doctoral dissertation.